Plagued by dry cold weather, our skin needs help. Yours most likely does too, though our tonics will not be the same. The skin we’re in is a true reflection of what we put into our bodies, our genes and how we spend our days (think: work-outs, stress, age, weather, UV rays). When we seek creams and solutions, it’s smart to spend time with a professional who can listen and create a treatment plan to suit our budgets and skin types. 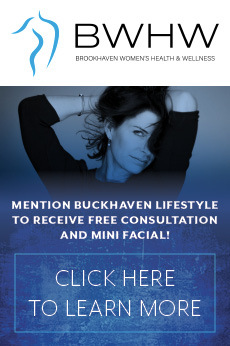 BuckHaven Lifestyle visited with a few pros for help. I visited Aesthetic Specialty Centre, the day after my birthday, entering the quiet and sunny office with a headache and a hopeful heart. I’d completed the patient background forms online (easy) so was quickly whisked into a spacious and dimly lit treatment room which resembled a hotel room more than a sterile medical practice office room. I appreciated that and the time Licensed Medical Aesthetician, Adina Sinasohn spent with me. She specialized in anti-aging (yes) and acne treatments and recommended a HydraFacial MD to help reverse the damage of the hours…years spent outdoors. Did you know that after the age of 20, a person produces 1 percent less collagen in the skin each year? I’m at a 35 percent deficit. In 50 minutes, my skin was micro-planed (a deft straight blade removed what didn’t belong), cleaned, lightly peeled, suctioned, boosted and nourished. The results was a baby bottom-soft face and a list of at-home and in-office treatments recommended by Adina. ASC offers a full menu of cosmetic surgery, dermatology, wellness and aesthetics. Body contouring, breast enhancements, facial rejuvenation and injectable fillers are carefully considered, with Dr. Marc Yune at the helm. His team of welcoming and educated professionals gave me the confidence to dive into 2017. I will be back! I visited Bluegrass Day Spa, beautifully designed, near Alpharetta. Launched by Nhi Huynh nearly ten years ago, I found ann expansive service menu, ranging from manicures and pedicures, boutique facials, to-die-for massages, and exclusive body treatments. Huynh asked about my skin – its sensitivity, condition, cleansing regiment, and additional challenges. Taking into account each factor individually, she made thorough recommendations around which services she believed would have the greatest impact have my skin. The salon’s signature SNS Manicure & Pedicure, Bluegrass Signature Facial, and Deep Tissue Massage was a combination that couldn’t have been more ideal. The spa at Bluegrass is separate from the main manicure and pedicure rooms. This detail, while subtle, was also critical in my ability to have a more relaxed experience, and was greatly appreciated by someone who values privacy. Upon meeting my aesthetician, I was asked additional questions regarding my skin, which was further examined in closer detail; and for the next 110-minutes, I drifted off into my own personal bliss filled with moisture infusing essential oils, gentle exfoliate, and deep tissue massage. My face and body were singing the praises of the thorough treatment it had just received. As someone who usually opts for gel nails, it was recommended that instead of gels, I try a gentler and environmentally friendly version of the gel nail. The SNS manicure, which is a thinner and more light weight version of the gel nail does not require UV light, and can be built out like pink and white powder. Additionally, the SNS manicure does not contain Formaldehyde, Toluene, or DPB. And I must say, the results did not disappoint, nearly 2 weeks later my nails are still look and feel as healthy as they did when I left.